In my last post I confessed my excitement towards Spring and mentioned how it had snowed. Well in case you didn’t hear the Midwest was hit with yet another snow storm. As I look out my window now as I type this there is snow on the ground. Even if it does melt by Easter it will still be way too muddy outdoors for an egg hunt. Guess we will just need to move it indoors this year. Oh well I reminded myself of last summer and 106 degree temps and drought and actually I am thankful for the snow, I am ready for it to be over too but indeed thankful. I am thankful we had enough wood to get us through the prolonged winter. I am thankful for the money it has saved us this year (since having it installed it has paid for itself already by allowing us to skip a months electricity payment every year, one year even 2 ). I am thankful our freezers are full of another years worth of nourishment for our bodies. I am thankful that we have learned how to make half a steer, a hog, 20 chickens (and a turkey) stretch a year for our family of 4 (those of us still living at home that is). I am thankful I can shake the hands and know the farmers personally who raised and processed our food. I am thankful I have learned how to replace dairy in some recipes with the beautiful stock the animals have provided us and how nothing has been wasted. Though we are not vegetarians one of our families principles is that the animals that lose their life to nourish ours be treated with utmost respect even after death. Another point that some tend to not quite understand about radical unschooling is “If children are not made to follow rules how on earth will they ever learn them?” It doesn’t take long for me to understand where a disrespectful child may have picked up their manners when I see their parents acting the exact same way. Another principle that is important to our family is the respect we show Mother Earth, again one that did not need to be “taught” to the girls but instead that they naturally picked up on from Papa and I composting, buying used when we can, and recycling. Something else we have done since the beginning is celebrate Earth Hour which took place Saturday. 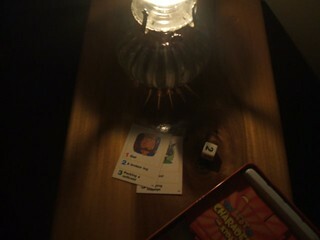 Like every year we played games to lantern light. Our favorites are Charades and we like to play the game where one person starts a story and everyone adds on to it. Sometimes we finish the evening with the lights off and act out our favorite stories or movies. Since I mentioned games there was more Frog Juice, Disney Headbanz, Disney Pictionary, and the board game Clue, where Little Sis can now read and follow along all on her own. Papa and Little Sis played more Connect 4 and we played more Pac-Man Party and Mario Party 8 on the Wii. 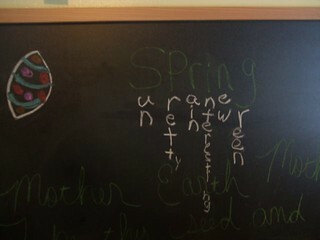 We decorated the board for Spring and have been playing around a bit where you create other words from the letters that describe a word you choose. It is harder than you may think. Miss Sky created another new board on Pinterest called Good Graphic Movies where she has been pinning her favorites and doing reasearch on others she wants to see like the original King Kong and Godzilla. She likes to read the reviews and has found lots of new favorites like The Incredible Shrinking man. She has also been doing reasearch on Native American weapons to help get ideas for creating her own weapons for her manga story. Oh and more Scribblenauts and Electroplanton on the 3DS. Our family movie was The Hobbit. Our favorite cashier, we always go to her aisle even when she has a long line, from the grocery store informed us it was a 2 parter that we did not know and I am glad she did because I would have been even more disappointed. I love Peter Jackson’s movies and understand why Lord of the Rings needed to be 3 movies but not the Hobbit. However I loved who he picked to play Bilbo and there was lots more humor than LotR. It really is beautifully made, we just didn’t want to wait longer to see the conclusion. 😦 We did enjoy picking out the tie-ins from the other movies too. So the weekend before last was in the mid 60s. The girls were outdoors Papa and I were working around the house, Spring was in the air (literally). About Tuesday we needed to fire the wood stove back up because temps dropped and it began to snow, snow in the middle of March. Too late the Spring cleaning bug had already bit. I am so antsy to get out and get our garden started. So many ideas swirling through our heads but until then there is plenty for me to get caught up with indoors. Closets needing sorted, cleaning out a certain little one’s closet so she can finally call her room her own. 🙂 I’m just ready you know. So like the start of Fall I am finding myself too busy again to keep track of our days. However I did learn from last time that I can write a few things here and take a few shots there and being that “school” for us is 365 days there is no reason I should even begin to worry about taking a few days off. I have noticed some new unschooling traffic here on my blog (Hello, I am smiling and waving to ya. 🙂 ) which makes me happy, happy instead of my Waldorf links. I have mentioned before how I’ve thought about deleting them but since this blog is about our journey and Waldorf education was a part of that, though I am very sad to say it, I won’t. I guess what I am trying to say is after making the journey from Waldorf myself it saddens me to see those headed down that road. It does make me happy though when I notice new inquires of unschooling. I love unschooling folks!! Love it, love it and so do the girls. Happy, happy children they are. Happy, happy parents we are too. Well to get back to my point, I think I have one, since I’ve noticed new traffic I wanted to mention again these posts are very brief summaries of our weeks. Really to be honest they are my memory. I couldn’t possibly keep track of everything we do daily( our conversations alone are priceless), it would take way too much of my valuable time away from my family. Learning all the time we are. I keep track of our main course so to speak, it helps me to be able to look back and see where some interests might be headed and helps inspire new ideas (and I sure do love seeing all those main dishes paraded around at the end of the year). 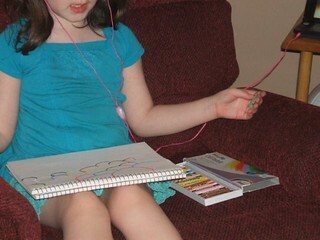 The girls have been recording music to their 3DS, so I am thinking an I-Pod soon. They are very much into video game soundtracks right now especially Kingdom Hearts and Final Fantasy. Actually Miss Sky has declared Nobuo Uematsu her most favorite composer. She was SO excited to learn he created the music for Super Smash Brothers Brawl because it too is a favorite soundtrack. I thought I would add their favorites from YouTube because like their Beatles’ love I think it would be fun to look back on. Miss Sky does like her battle music, Liberi Fatali from Final Fantasy 8. Little Sis not so much, Namine’s theme form Kingdom Hearts. Me I know these soundtracks by heart. Speaking of Final Fantasy the girls have been watching the Advent Children in Japanese with English subtitles and are learning so much between this and reading manga, I am too actually. Games? 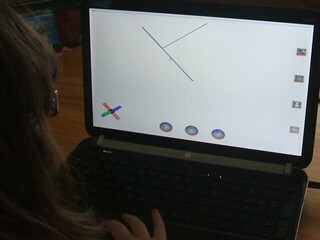 Miss Sky has been playing more at gamevile.com and Little Sis at Animal Jam. Scribblenauts for both where Miss Sky has passed the game. What makes this game stand out in my opinion as great is once you pass the game you can free play creating your own worlds for unlimited play, I guess that is why it’s called Scribblenauts Unlimited. Oh and more at girlgames.com. As A Family, 007 on paintball mode. Yes I didn’t know you could change this feature so now it doesn’t feel like we are killing each other but strategizing our attack with paint, (a lot of )Pac-man Party where we have already played every board, (more and more) Disney Headbanz, Disney Apples to Apples and Frog Juice. Little Sis has been reading some of her favorite Little Golden Books to Papa before bed and Miss Sky’s inner artist is emerging. 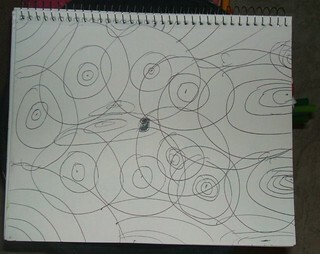 I love the differences in the girls art work, their curiosity each heading in a different direction. and is still working on her manga story (where she is putting her drop knowledge to use 🙂 ). Last but not least our family movie was Rise Of The Guardians where both girls give it 2 thumbs way up. Yeah it is going to be added to our collection. I have lots to catch up on so when reading this please realize I am combining several weeks of learning together in one post. The hardest part for me right now is finding just where to start so I guess I will go with movies. Something I did on Facebook for fun because I for one was tired of all the headlines (particularly dealing with our government right now) I asked the question if you were moving to an island and only had room enough to bring 5 movies along with you what would they be? What movies if moving with the chance to never purchase or see another movie again would you not want to be without? I received a very diverse list and discovered Papa had never seen The Goonies (Hello!!) and added several to our very growing list on Netflix. It was fun seeing how and what movies speak to different people ( and please feel free if you’re not feeling too shy to add your own favorites in the comments 🙂 ). Well I thought it was a perfect time to share Fried Green Tomatoes with Miss Sky (I saw this movie with my childhood best friend at the theaters when it came out and fell in love with it. My best friend and I were so different from each other just like Idgie and Ruth, um lets just say I wasn’t like Ruth and leave it at that. Since then I have shared it with my little sister and Big Sis, our oldest who is now 22, when they were Miss Sky’s age so it has kind of became a tradition) so I grabbed a box a tissues, you will need them, and away we went. 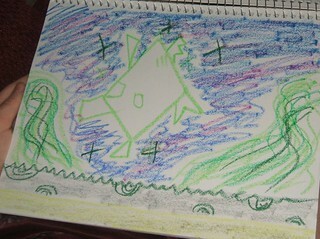 We also watched the anime movie Princess Mononoke which Miss Sky has declared it her favorite Hayao Miyazaki movie yet. I will warn you though it does have a PG-13 rating as well as blood and some beheadings. Miss Sky didn’t think it was bad but it might be a bit scary to some. For Little Sis it was more Kipper and Babar. We made the trip to Hobby Lobby for new supplies and some new flowers as well. It was fun watching the girls pick out which flowers they wanted and the colors. Speaking of flowers the girls have also been busy making their own silk flowers. We picked up a few other new supplies too. Little Sis has been wanting to find a manga series she could read besides Kingdom Hearts. 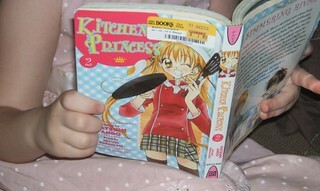 There is other Disney manga but that is not what she wanted so I did a little looking around on-line and found the series Kitchen Princess. It is perfect for Little Sis as she loves to help in the kitchen and I have yet to find anything inappropriate for her. Speaking of kitchen with Papa home on vacation Little Sis and Papa decided maybe making chocolate chip cookies sounded good and went straight to work. 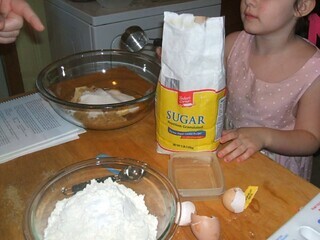 Little Sis informed Papa he was not making them like Mama, he does not like to spoon out the flour then level it off the top and didn’t cream the butter and sugar before adding the flour mixture, which Papa replied “That’s okay” and so when the dough came out way too dry Mama was called into service to fix things. They were not my cookies but I did manage to save them enough that they were edible. Papa learned maybe he should listen to Little Sis a bit more when it comes to baking. New games? 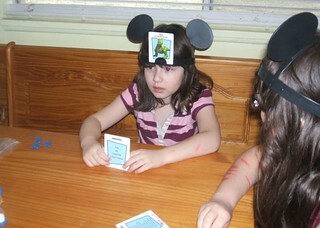 Yes we added the game Disney Headbanz to our collection. I will be adding it to our favorite games list as well. We love it , even Miss Sky, and have been playing it daily. I like that we can use the cards from the game Sherlock, another favorite game from the list, to make it different and the girls even mentioned making up our own on index cards. That makes it a winner in my book. and Need For Speed The Run. It can be played with 4 players unlike the one for the Playstation. I don’t know why it has bad reviews we really like it as a 4 player game and taking turns playing it single player story mode to unlock new tracks and parts for multiplayer. “Mom how do spell phone, Mom how do you spell sparkly, Mom how do you spell………. ?” I love it! Miss Sky found the game Freakyforms Deluxe that both girls enjoy as well. We also played 007 and Papa and Little Sis played more Connect 4 and Memory. The girls are taking over my Pinterest adding several new boards. 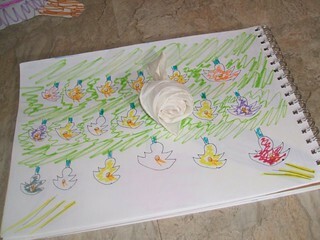 Filled with drops, feathers, flowers. I do not mind one bit. 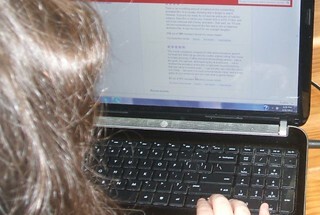 It is a wonderful way to stay connected, to “strew” new ideas, games, or movies. Of course I will add this is for fun, if the girls thought I was doing it as part of “school” it would kill that fun. We have deschooled and the girls don’t realize when they play Minecraft, or Animal Jam, or Scribblenauts, or Pinterest they are doing it for me to record it as “school”. They do it because it is fun and learning happens because of that. I see schools trying incorporate Pinterest and Minecraft and though I am glad they see how educational they are. Once you take something that is played for fun and turn it into a lesson it kills the joy, the discovery. I do not know personally how they are being used in school as the girls don’t go. This is all me forming my own conclusions. I just hope if they are using them they don’t take charge and turn them into lessons. The same goes for homeschoolers too. Let them have fun and direct how *they* want to use them. 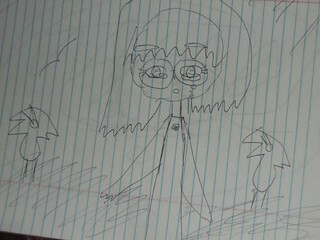 I think all I have left is to add more of Miss Sky’s drawings. 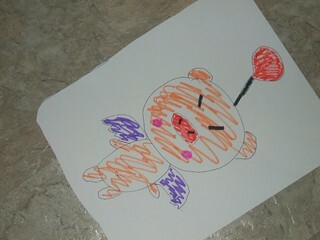 and from Final Fantasy (a moogle). Whew! So in my last post I talked a little bit about how unschooling works for our family, 🙂 , but what exactly does radical unschooling mean? The title itself sounds rebellious right? Unschooling means not school and is an alternative way to educate by trusting that since we as human beings are natural learners that maybe children can learn without the need of school. It is trusting that children will learn what *they* need without having to be taught (like how they learned to talk and walk). As I mentioned in my last post that does not mean we as parents do nothing. We still have our role to play. Well if we as parents can trust our children with their own educational needs just maybe we could trust them to make their own choices on how much sleep they need or what kind of foods they need too. However not everyone agrees, which in my own personal opinion is kind of funny I mean I think trusting one to their own education is more scary than food but everyone is different, so the term radical unschoolers was phrased to help clarify one group from another (because at the time it was a pretty radical idea and some unschoolers didn’t want to be classified as *that* radical and still don’t really). So some families are unschoolers and some families are radical unschoolers. Then there are some people who unschool everything but math or some people think unschooling is allowing children the choice but only from “school” type materials and it can get confusing who is really unschooling and who is not (Why adding freedom to the mix muddles thinking even more). Honestly what we call ourselves is not as important to me as being the girls partner but for the sake of being clear about what we do for anyone else that may come along and read here I label my posts as radical unschoolers. So that means we (Papa and I) trust the girls not only with their education but with making their own choices about how much time they want to play video games, or watch television, or what they want to eat, or wear, or sleep, or…… we trust them to make their own decisions about themselves. THIS DOES NOT MEAN HANDS OFF PARENTING!! Papa and I work together as the girls more experienced partners helping them come to their own conclusions. This is when all the naysayers start in with “but, but if I let them they would run wild in the streets, or they would play video games all day, or eat ice cream for breakfast”. Yes there are lots of buts so I have a story my grandmother told me , sorry dad 🙂 . As a little boy my dad loved coconut! Well one day when my grandparents were not looking my dad found the coconut and ate as much as he wanted. He ate and ate and ate until he got sick. To this day he still remembers what he felt like and will not eat coconut. He learned on his own why eating lots of coconut might not be such a good idea. Now this does not mean I want the girls to get sick in order to learn a lesson (why we are their partners) but lets look at why my dad might have got into the coconut in the first place. My grandparents were products of the great depression and sweets was a treat. Actually my grandmother was raised in an orphanage and treats were nonexistent. My dad was acting from being in a controlled environment where sweets were limited and found what he so desired, as a little boy, and indulged his little heart out. He had to sneak because if asked to have some the answer more than likely would have been no. I understand times were different in my grandmother’s generation but this is what being the girls partner looks like in our home. We find ways to meet their needs. They are able to discover who they are, what they like and don’t like and make those decisions for themselves. They are learning how to be independent adults. Is that not what parents want for their child? For them to know how to make their own choices? You can replace coconut with television, or video games, or anything that you possibly don’t think your child could make their own decision if given the chance and the outcome will still be the same. We came to radical unschooling from Waldorf education. The girls television was very much controlled so was their food choices and just about everything else. Sandra Dodd tells all radical unschoolers “Read a little, try a little, wait a while, watch” don’t let everything go all at once. Don’t do what you don’t understand. So I started with television and yes like my dad with the coconut they indulged their little hearts out. Why? Because they had to trust that I wasn’t going to take the TV away again. Yes, I was worried I had those Waldorf voices in my head saying “SEE, they can’t handle it” but I kept “reading a little” and “watching” and instead of being negative about the television I joined them and found out what it was they enjoyed SO much about it. Guess what? They still watch a lot of television, so do Papa and I. We love movies!! It is something that brings us joy. We also like being outdoors. In fact if given the choice between going outdoors or the television the girls will choose outside. We have fires in the backyard, and listen to music, and cook out, and play games. When it gets dark the girls lay out blankets and look up at the stars until they fall asleep and Papa and I bring them to their beds. 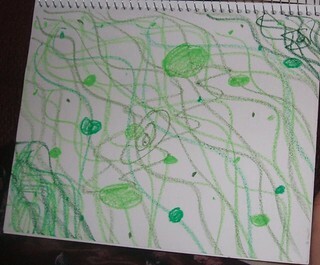 They also like to draw, and read, and listen to music, and play video games. It brings them joy. Why would I not want the girls to have a joyful childhood? I guess the whole idea does sound radical. It is so different from mainstream, from what we are being fed, from how we were raised. Kind of like homeschooling is a little radical but we know now homeschooling works. There are grown homeschoolers getting married and living out in the real world just fine. There are grown radical unschoolers out living in the real world too. *I* know it works. I wonder how many people thought electricity was radical or women voting was radical? Just because we might not understand something does not mean it can’t work. Papa and I trust our girls (all 3 of them). We know who they are. They will make mistakes just like my dad and his coconut but that isn’t because of radical unschooling. It is because that is how we learn. So Papa was on vacation last week which in our home means production(why I was short on posting). In our home it is Papa who keeps the ship rolling as I tend to procrastinate a tiny bit, okay a lot. When I wake up I like to have a cup of tea and ease into my day. Papa likes to get up and get things done to have the afternoon. Part of keeping a peaceful home is making sure *every* member of the family is happy not just the children. We needed to work out a few kinks and the compromise that *we* arrived at was for Mama not to get grouchy I needed tea and so on those days when Papa is home and we have stuff to get done we watch an episode of something, I drink tea, the girls wake up, we grab a bite to eat and head out (which means on my part in order to have my tea time I must have everything in order the night before so I can be ready speedy quick the next day). It’s win, win for everyone. I do also want to add what helps *a lot* with the girls is letting them know the day before everything that needs to be done the next day. They know before they go to sleep there are things that need to be done. Papa has also learned to “let go” that if something just isn’t going to happen like he had planned it’s okay and we work together to find a solution. Maybe, for him, that means doing something around the house that needs done and doing our running the next day. Maybe it means me doing the running and the girls staying home with Papa. My point is that nothing ever needs to be just black or white, there are *many* choices between A and B. There is a deep discussion going on in a unschooling group (That normally I would mention or link to but which one it is honestly is not the point because really the topic applies to unschooling in general.) about unschooling being compared with freedom. This has caused confusion with new unschoolers it seems as some parents take this to mean they are free to do whatever the hell they feel like and modeling this message to their children. The thing is none of us are really free. It doesn’t matter which state or country we live in we *all* have laws that we *must* follow. Indiana is a wonderful state to homeschool with very few laws that I must abide by but I *do* need proof of 180 days worth of attendance. Not being able to provide that is risking my chances of homeschooling. There has been a case here in our state of 2 women not being able to show this and lost their right to homeschool. Their children are now in school. It can and has happened. Somewhere the message of unschooling has been lost as an alternative way to *educate* children. I mean the word itself was invented by a school reformer. As unschooling parents we still are *responsible* for our children’s education. Yes children learn naturally but it is still our responsibility to facilitate and set our homes up for that learning to flourish. I *know* children can learn from watching television shows like South Park and The Simpsons and I *know* that children can learn from video games but children still need a more experienced partner to help answer questions that may arise from these things. They still need a partner to bring in *many* different kinds of resources that maybe our children did not know existed to help feed their interests. (Not workbooks unless your child likes to do them for fun and sees them no different from like coloring books or word searches, which I like to do.) They still need a partner to help them understand that here in the United States you need to pay taxes. They still need a partner to tell them if you break the laws you will pay the consequence. When we decided to homeschool, the girl’s education became our responsibility (and there are different choices how to homeschool). It is our (papa and my) responsibility that the girls be able to survive in *this* world, not some *free* fantasy world that does not exist and Papa and I take that responsibility * very* serious. Unschooling is a wonderful alternative to school. I personally *know* it works. I am sad to see it get a bad reputation. I am sad that when I do tell people we unschool, because I myself am so passionate about it, that people roll their eyes at me and say OH. I am sad that our family is already labeled “wild” because of a few bad examples (because we are far from wild let me tell you 🙂 ). Parenthood is hard, it is a responsibility all of its own. Homeschooling is hard. Papa and I work hard to make sure we are doing *both* well (not just good but well and always striving to do better). I hold myself to very tough standards(because I want to), that is what this here blog is all about. 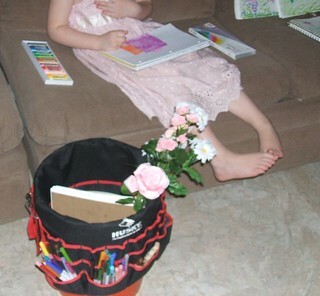 This blog is our journey and I hope to provide a positive example of unschooling.